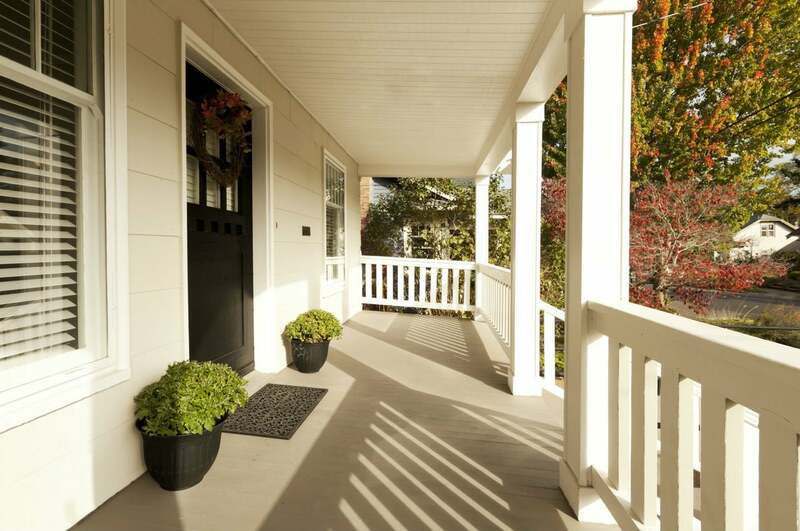 Here’s what to consider when painting your entryway’s biggest attraction. Q: I want to repaint my front door to cover up some old water stains. What is the best paint for front doors? A: A fresh coat of paint can hide minor imperfections on your front door, defend it against harsh outdoor elements, and boost curb appeal in a big way. But to get these entryway assets, you can’t slap on any old paint. The best paint for a front door will have a blend of qualities that maintain its integrity and looks in the face of stormy weather and scorching sun. You’ll want to consider paint durability, sheen, color, and suitability for your door material. Ahead, everything you need to know about picking the right paint and primer for your front door. Both dedicated exterior paint (used in addition to a separate primer, covered below) and exterior primer-and-paint-in-one products will do the job. Today’s primer-and-paint combination formulas often cost half as much as separate primer and paint and provide equally good coverage in some scenarios. 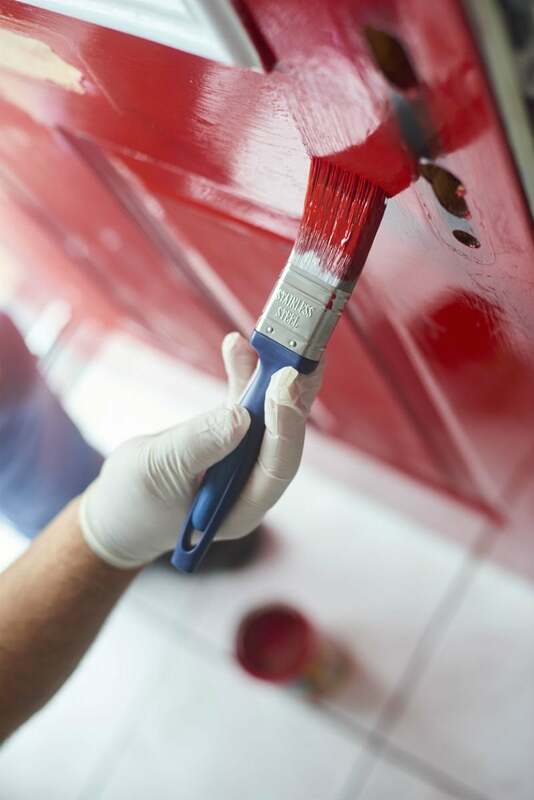 The choice of separate paint and primer versus primer-and-paint should come down to the condition of your door. You’re painting a bare front door for the first time. You’re repainting a previously painted door in the same paint color. You’re switching from a lighter to a darker paint color. You’re painting over a stained wood door. You’re switching from a darker to a lighter paint color. The existing paint coat is peeling or flaking. You want to cover an old oil-based paint coat with a water-based paint coat. Always use a coordinating exterior primer if one isn’t built into your paint. If a separate paint and primer are needed, be sure that the primer is labeled for exterior or interior/exterior use, too. Either a water-based primer (Zinsser Bulls Eye Primer, $22.47 for one gallon at Home Depot) or an oil-based exterior primer (e.g., KILZ Exterior Primer, $22.98 for one gallon at Home Depot) should suffice. But if you’re painting over an existing oil-based paint coat with water-based paint coat, you must use bonding primer (e.g., KILZ Adhesion Bonding Primer, $41.67 for one gallon at Home Depot), a special primer formulated to stick to glossy surfaces like that of an oil-based paint coat. The color of the primer should also be close to that of the paint, e.g., a light gray primer for a lilac door. You can also ensure a perfect color match by buying a white primer and having it custom-tinted at the paint store to match your chosen door paint color. Let door material dictate your choice of paint base, oil or water. For a door made of pine, white fir, or another wood species that doesn’t bleed (i.e, gives off tinted compounds in wood called tannins), go with a water-based exterior paint (such as BEHR Premium Plus Ultra Exterior Paint and Primer, $42.98 for one gallon at Home Depot). Water-based paint emits less smelly odors (because of lower solvent content), dries faster, and results in less color fading. For cedar, cypress, or other wood that bleeds, choose an oil-based exterior paint (e.g., Rustoleum Protective Enamel, $16.92 for two quarts at Home Depot). Oil-based paint is less susceptible to tannin bleed-through (tannins can seep into water-based paint and show as unsightly yellowish-brown splotches in the final result). For metal doors—such as a steel storm door—work with oil-based paint to stave off the formation of rust. 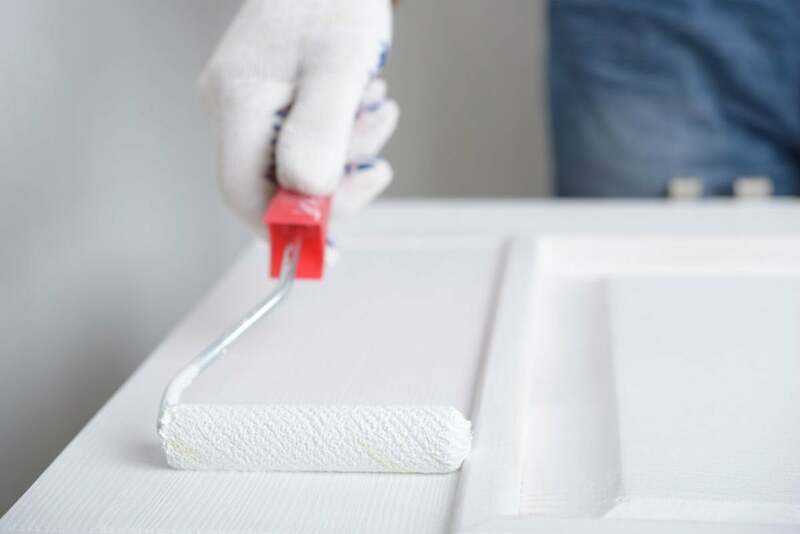 For fiberglass doors, apply a water-based paint, as its thinner and less sticky composition goes onto the slick surface of fiberglass more easily than thicker, stickier oil-based paints. Go for a semi-gloss finish, which is as durable as it is attractive. Exterior paints are sold in flat/matte, eggshell, satin, semi-gloss, and gloss sheens, in order of the lowest to the highest luster. Semi-gloss is ideal for front doors, as it’s more wear- and stain-resistant than flatter sheens. It’s also more reflective, which means it easily wipes clean, highlights carvings or other architectural flourishes on the door, and provides an attractive pop of shine in the entryway. Yet semi-gloss will mask imperfections better than a gloss sheen, which can draw attention to divots, errant paintbrush strokes, and other minor door flaws. 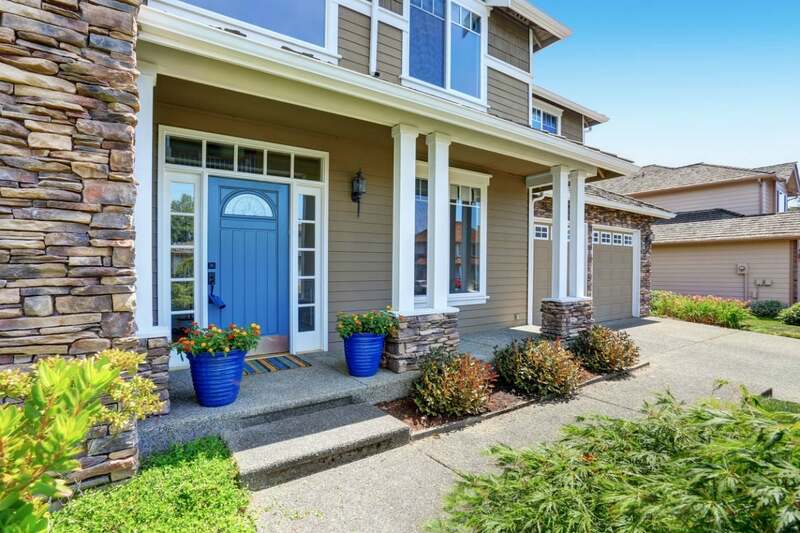 If you don’t have a storm door, awning, or a shade tree in the entryway to protect your front door from continuous sunlight exposure, the onslaught of UV rays can eventually fade its paint color. Exterior paints labeled “fade-resistant” or “UV-resistant” are formulated with colorfast pigments and a higher volume of binders than ordinary paints that allow them to retain a crisp color despite prolonged exposure to intense sunlight. Select low-LRV paint colors, which tend to be more muted, to preserve the color and the door itself. The most important consideration to make when selecting a door paint color is its light reflectance value (LRV), a value on a scale of 0 to 100 that indicates how much light reflects from the paint color when dry. The higher the LRV, the more light the color reflects, and the less likely the paint finish is to fade with sun exposure. The LRV will be listed on the paint manufacturer’s website or on the paint chip, a card showing the range of colors available for a particular paint brand. Look for an LRV of at least 55 to ensure that your painted door reflects a fair amount of sunlight and retains its color. In general, lighter, more muted shades, such as beige or mint green, have a higher LRV, whereas darker, richer colors, such as cherry red or navy blue, have a lower LRV. Black paint, which often has an LRV of 0, depending on the brand, reflects virtually no light, which means it will absorb most of the light that hits it and fade quickly. In fact, certain door manufacturers will even void your warranty if you apply black paint over it because the high heat absorption can warp it. But, if your warranty will allow it and your front door is shaded, you might still find the color’s positive impact on home resale value worth the risk. In 2018, the real estate database Zillow found that homes with black or charcoal gray front doors sold for $6,271 more than expected in its 2018 Paint Color Analysis of sold homes around the country. Beyond LRV, choose a color that complements the color of the door trim and the siding of your home. 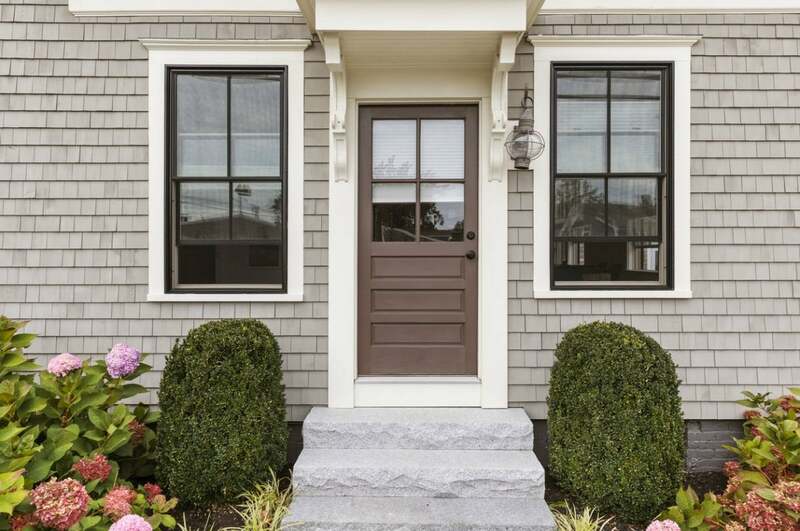 For example, a light taupe door would pair well with white trim and brown siding. Pick rot-resistant paint if you see a lot of rain or snow. Traditional exterior paints are certainly more rot-resistant than interior paints, but they can still form a fair amount of mildew or mold with enough exposure to water or humidity. So look for a paint specifically labeled “mildew-resistant” or “mold-resistant,” especially if you live in an area that receives a lot of rain or snow. These paints are formulated with antimicrobial chemicals that prevent mildew and mold from setting into your paint job for a certain period of years indicated on the paint container.